It was 10am in the morning. A torrent of unbearably loud music got me up on my feet out on the road. I saw many loudspeakers that had been installed overnight, from Nagasandra circle to Thyagarajanagar, all along the main road. Sound should not be audible beyond 200 feet, says the law. Pic: Shamala Kittane. Evidently, a nearby temple had decided to celebrate ‘Annamma Devi Festival’ – a borrowed tradition from a village but now out of context and place. A local JD (S) politician, Adisheshaiah, however decided to keep the tradition going. The festive season in Bangalore begins in August and goes on for next two months, with Dasara, Diwali etc. Various gods are appeased with appropriate pujas alongside noisy celebrations. It’s Annamma Devi festival in this case that drove me to the nearest police station. Clearly the noise was beyond tolerable limits and in complete violation of noise pollution norms. According to Karnataka State of Environment Report and Action Plan-2003. The Noise Pollution (Regulation and Control) Rules, 2000, have set the standards for noise levels in various areas in our country. The day time refers to the time period between 6 am and 10 pm. The period in between has been referred to as night. A silence zone is defined as an area comprising not less than 100 mts around hospitals, educational institutions and courts. Clearly the Annamma Devi function was in violation of all the norms and I had a strong case on my side. When I reached the police station, it was afternoon and the policemen were busy distributing packets of lunch. I tried to explain the problem to them. They were willing to take the complaint but they wanted my name and address. I was aware that complaints can also be taken anonymously told them that it was their duty to enforce law when it is being violated, irrespective of who is complaining. One of the policemen tried justifying the organisers, asking me, would I not be using loudspeakers when I have a function at my home. I demanded to know whether the organisers of Annamma Devi had obtained permission, the policemen told me to go to the office of Deputy Commissioner of Police to get an answer. So I went to the DCP’s office at Sound End circle, Jayanagar. I was shown the board showing visiting hours by a constable, indicating that I can meet the DCP, H S Revanna only between 4 pm and 6 pm. I told him I was not a visitor, and I was there to complain regarding the loudspeaker problem. He said the DCP was busy in a meeting and directed me to ACP of Bangalore South, M N Babu Rajendra Prasad. To my relief, the ACP heard me out patiently and ordered a few of his colleagues to look into the issue. In any open space any loudspeaker or other apparatus for amplifying any musical or other sound, at such pitch or volume as to be audible beyond two hundred feet from the place at which the musical or other sound is produced or reproduced, except under and in accordance with the conditions of a licence granted by the Superintendent or in such local area by such other officer as the State Government, may, by notification in the official Gazette specify in this behalf. The ACP promised to have the speakers confiscated and issued orders to have them removed. When I returned home, the noise had subsided, but the speakers stayed. The event continued for the next two days. However the noise level remained under check, within tolerable limits. However, on the third day, the noise was at its peak marking the end of the festival. It was an orchestra. I put up with the unbearable noise levels till 10pm, before calling 100. A Hoysala team arrived and put a stop to it after another agonising half an hour, while I was tensed and was praying to goddess Annamma Devi, that I wouldn’t have to call the police again. hormonal responses (stress hormones) and their possible consequences on human metabolism (nutrition) and immune system. Eardrum is damaged when exposed to very loud and sudden noises. The hair cells in the inner ear are chronically damaged. Prolonged exposure to noise of certain frequency pattern leads to hearing loss. According to Kryter in 1970, noise causes heart beat to decrease with fluctuations in arterial blood pressure and vasoconstriction (decrease in the diameter) of peripheral blood vessels. Studies indicate that blood is thickened by excessive noise. Eosinophilia(a symptom of allergy), hyperglycaemia (Abnormally high blood sugar), hypokalaemia (Abnormally low level of potassium in the circulating blood leading to weakness and heart abnormalities) and hypoglycaemia (Abnormally low blood sugar) are caused by alteration in the blood due to noise. Noise affects professional performance including the ability to concentrate especially of those who require precision and attention in their work. Exposure to high noise levels for short period of time can result in temporary loss of hearing. Exposure for long periods of time can result in permanent loss of hearing. High noise levels are dangerous for foetus and can cause behavioral changes in pets. inconvenience are becoming a regular feature in the city. It’s time we become aware of the consequences of noise pollution. 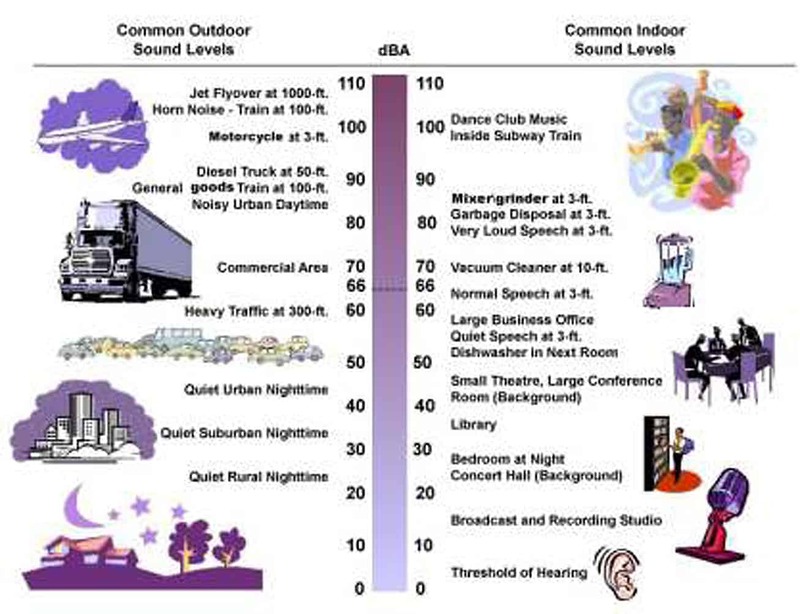 The picture below will give you an idea of measuring the sound you are surrounded by. You can approach Karnataka State Pollution Control Board (KSPCB) for complaints against sources of noise that are permanent. KSPCB will issue a notice to the offending party and order a permanent solution. According to Vijaya Karthikeyan, Environmental Officer at KSPCB, noise pollution by loudspeakers does not come under the jurisdiction of KSPCB. The Superintendent of Police is the ultimate authority in this regard, and has been empowered to enforce law and take action in cases of noise from loud speakers, crackers, processions etc. that require immediate action. Similarly, complaints against noise from motor vehicles go to the traffic police. Complaints on hotels and other private organisations go to BBMP. After a few days, when everything got back to normal, I was left with the nagging urge to seek answers to the many unanswered questions, such as the number of permissions that can be granted by the police in an area, the criteria for granting a permission etc. This took me again to the ACP. Bangalore South ACP Prasad took time to clear my doubts. “There is no limit on the number of permissions we are authorised to give, we mostly give the permissions. In some cases like in cases where hospitals are nearby, we (do) reject,” he clarified. “We only give permission for mike sets, not for public address systems. If rules are violated, we file a case against them and confiscate the loudspeakers,” the ACP added. You may not be able to pronounce Baiyappananhalli, let alone spell it. But Bengaluru’s Metro phase I starts there in its run to MG Road and here are the fares.